Welcome to the Owen Building Group Web Site. 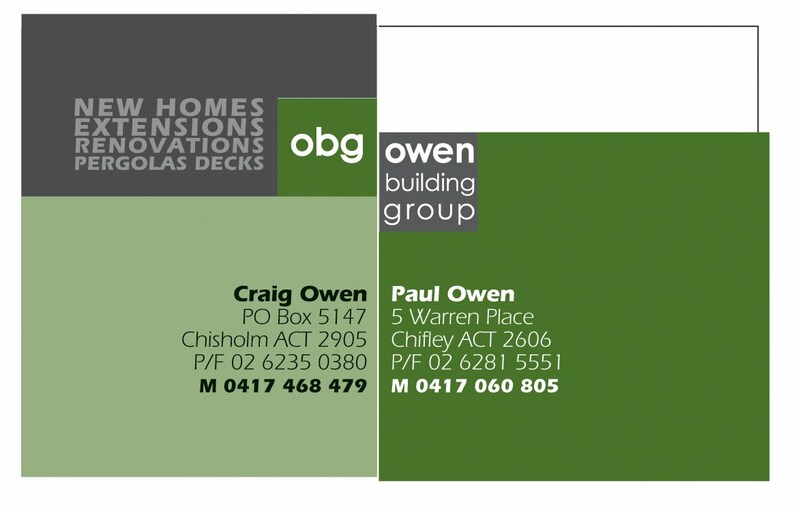 Hi my name is Paul and with my brother Craig, we are the Owen Building Group. Together we have been building in Canberra for over 30 years. Ours is very much a “hands on” business, in that we oversee the entire project personally. We always want to be sure that the quality we put our name to is not compromised. We pride ourselves on the high quality work we have been producing over a long period of time. We endeavour to address all queries that people might have, quickly and professionally. All of the sub-contractors and companies that we have chosen to be involved in your project have been selected for their professionalism, reliability and commitment to quality. We are a relatively small company that focuses on the personal approach; with a view to keeping the project moving quickly, and a commitment to finish all projects in a reasonable time frame and with as little inconvenience as possible. We strive to offer a competitive price that takes into account all the above benefits and does not compromise on quality or finish. It is our philosophy to make our customers as comfortable as possible with the investment they are undertaking and with the builder they have chosen. At the end of our quotes we provided you with a list of people who have had similar work completed. Please feel free to contact any or all of them for a reference as to the quality of our work and the satisfaction we were able to provide. We quote to finish a job not just start it.